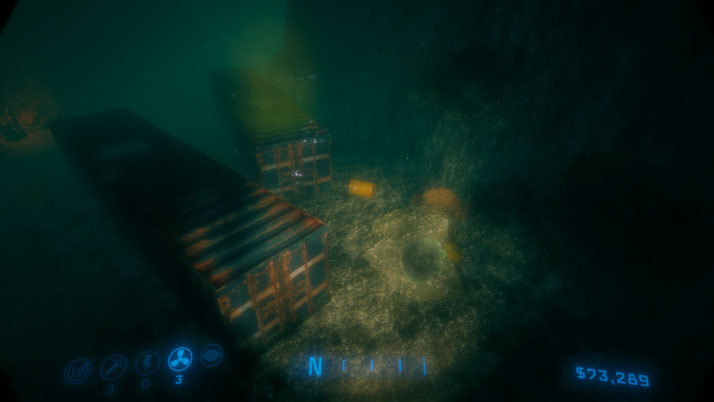 Neptune’s Flux is an atmospheric, exploration title from Zoxide Games, in which the player takes on the role of Sarah, and underwater adventurer and salvaging expert, who is employed by a huge corporation in a dystopian future. Released on November 15th, 2016, this Indie Adventure title gives players an opportunity to hunt down ancient artifacts in a Sci-Fi version of the ocean floor. But is it too reliant on hype and VR compatibility? Neptune’s Flux takes place entirely underwater; deep blow the surface, years after society fell into ruins, Sarah’s mother went missing years ago and it left her daughter with nagging questions. The trouble is that this game lacks the atmosphere and scene details one might expect from an ocean adventure – there are a few schools of awkward fish here and there, or a cluster of jellyfish, but otherwise the scenery is bleak and feels unfinished. The details on sunken vessels are better, but it’s still vastly minimal compared to most underwater-oriented titles. It makes for a very lackluster environment, in what could have been a highly immersive, fascinating location. As someone that enjoys exploring the ocean floor in various game series, I was really disappointed by just how empty the world is here; there are sunken ships, cargo to be salvaged, and some devices, but otherwise it’s disappointing and subdued. A.Q.U.A., the company that Sarah works for, seems questionable as best in terms of intentions. I don’t want to give too much away, but the story revs up quickly with clues that everything isn’t as it seems in Sarah’s world – and that her employers might be up to something less than ideal. Everything is from the first-person perspective of Sarah, in her dive pod, which feels a bit clunky; I found that I had very little understanding of the actual size of the pod, until I was trying to navigate some narrow, triangular hallways. It would have been nice to see a third-person shot of this vessel, just for a better mental image of the construction, and added immersion. There’s even a moment at the very end, that would have provided a perfect chance for a glimpse at Sarah or her dive pod, but the screen simply fades to black. This review is based off a non-VR version of Neptune’s Flux, but this title is entirely VR-ready for both the HTC Vive and Oculus Rift; it also has full controller support, so there’s a variety of ways to play depending on player’s preference. 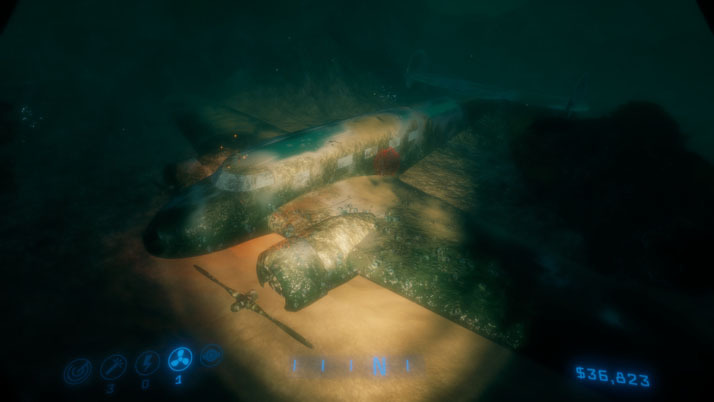 And it could be a lot of fun, exploring wreckage in the ocean floor, if only Neptune’s Flux had a little more to offer players in terms of details. One thing that this game definitely has going for it is the pleasant, “professionally mastered, positional audio” that really brings the landscape to life. The voice acting is definitely enjoyable, too, especially in the case of Sarah, whose voice reminds me of Mila Kunis; her boss is similarly well done. The trouble is that these qualities, which – especially when paired with VR – could have made for an extremely engaging, complex experience, fall short. There just isn’t enough meat on the bones here, and the playtime for defeat Neptune’s Flux is also fairly minimal; I had completed every task in under two hours of play, and a lot of that was drawn out due to slow in-game movement along with running back and forth. Neptune’s Flux feels like an incomplete demo, or at least a project that’s still in beta testing, but the current status is completed. It’s a fast game to play through, which isn’t necessarily a deal-breaker on its own, but on top of that the landscape is boring and the storyline is lukewarm; there were moments, when Sarah uncovered something and the mystery seemed more intriguing, but the ending felt abrupt and unsatisfying. The implementation of VR is a nice addition, but I’d have expected much more detail and complexity in a game designed to take place far beneath the ocean surface. Instead, it’s bleak, repetitious, and bland. After the finale, I was left wanting more, but unfortunately not in a good way. I wasn’t eager for a sequel; instead, I felt like I got an incomplete glimpse into Sarah’s narrative, and just a tiny piece of what could be a huge, intriguing plot. Perhaps if additional DLC is added down the line, with new story arcs and wreckage to be discovered, Neptune’s Flux will have more to offer its fledgling fan-base. Unfortunately, without more content and polish, I fear this story-driven saga will fail to be memorable past those initial two hours of playtime.